Beautiful map featuring the division of the Crown of Castile. Regnorum Castellae Veteris, Legionis, et Gallaeciae principatuumq Biscaiae, et Asturiarum Accuratissima Descriptio. This is a scarce c.1721 map of northwest Spain by Frederik De Wit. 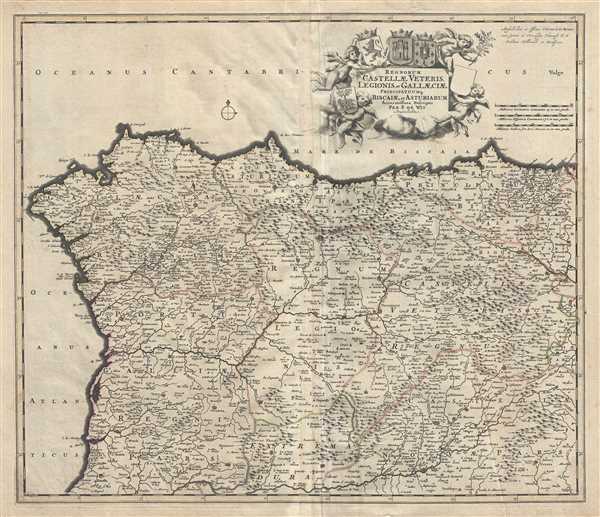 The map depicts the northern divisions under the Crown of Castile, including the part of the Kingdom of Leon, the Kingdom of Castile, the Principality of Asturias, the Kingdom of Galicia and the Lordship of Biscay. This region is also an important stop on the medieval pilgrimage route to Santiago de Compostella. It also includes parts of Portugal. The entire map is depicted in extraordinary detail, offering both topographical and political information, with forests and mountains beautifully rendered in profile. A beautifully engraved title cartouche in the top right quadrant features the coats of arms of Galicia, Castile and Biscay held up by three cherubs. A fourth cherub holds up a blank coat of arms. The map was issued by Covens and Mortier and printed shortly following their 1721 acquisition of De Wit's plates from Maria De Wit. Very good. Overall age toning. Minor wear along original centerfold. Minor creasing. Some spotting.